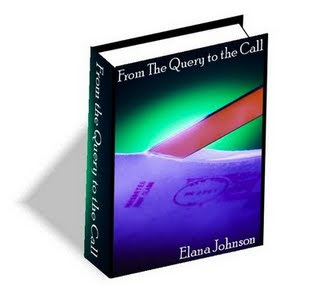 "From the Query to the Call" is a great e-book written by Elana Johnson coming out on Monday, September 14th. Elana gave me a sneak peek of her book and I found it to be very insightful and educational and very concise. It's a great little book at 63 pages, which I printed out, because it chockful of information and I wanted to put it in a notebook so I can refer back to it time and again. It also has the personal touch with Elana's personality shining through. I'm still in the middle of rewriting my first book and have be wondering "what will I do when I'm done? What is so important about this query letter I keep hearing about?" It seemed from all I had heard about writing a query, it is like writing a resume for employment. I've written a few resumes over the years and generally you just gear it to the company you are applying with. Easy enough, if you know anything about the company. So how is writing a query letter different? Evidently, a lot! Reading "From the Query to the Call," showed me I know absolutely nothing about writing a query. "From the Query to the Call" simplifies the process and spells it out easily enough with plenty of examples to show you the way how to write that killer letter that will gain the interest of an editor or agent. The book is broken down into two parts: 1) Writing a Killer Query and 2) Entering the Query Trenches. The first part is full of examples as she walks you through writing your query including how to hook the reader and get their attention, describe your character and setting, establishing the conflict and the consequences for your character. She takes you step by step through writing a killer query and what will grab an agents attention. The second part walks you through researching agents, sending out your killer query and responding to requests, revising for an agent and that so important part, fielding "the call." There are internet link to online resources such as querytracker and rally storm to name a few. Also included are interviews with several agented authors on how they handled "The Call" which are all quite interesting and amusing. Elana takes the fear out of the query process, with her step by step approach and practical advice on how to best write a query. I really enjoyed reading the book and learned a great deal. I highly recommend it. For more information and to see what others are saying about "From the Query to the Call," head on over to Elana's. She's hosting a contest and giving away one free e-book and she will have something special for the first 20 buyers of her book on Monday. That sounds pretty interesting and I hope that it helps you write one heck of a query letter so that a publisher says " I have to read this lady's book!!!" Was just adding your feed to my Google Reader and saw this post! What an interesting book. I will be ready to read it soon, I hope!